‘If you haven’t braked by the time you come over the crest and see the bend, you’ll crash’. Wise words of an ex-British Touring car champion that are now ringing in my ears as I approach Molecomb Corner at the 2018 Goodwood Festival of Speed. Flying under the footbridge and through a slight kink left my eyes are on stalks. I’m peering through the scuffed visor of my faithful old karting helmet, simultaneously scanning the tarmac ahead for the crest of doom while praying that I don’t catch sight of the corner first. Not one for wishing to skid gracefully into the hay bales at the best of times, I’m especially keen to avoid such a destructive fate today. One, because there’s lots of people watching and I don’t want to make a tool of myself, and two, because of the car I’ve been entrusted with. 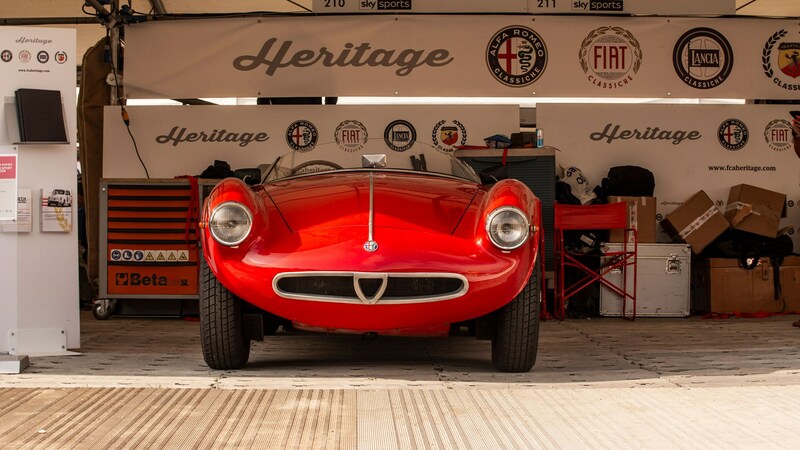 Namely, a near priceless 1954 Alfa Romeo 1900 Sport Spider – of which only two were built, and just one remains. 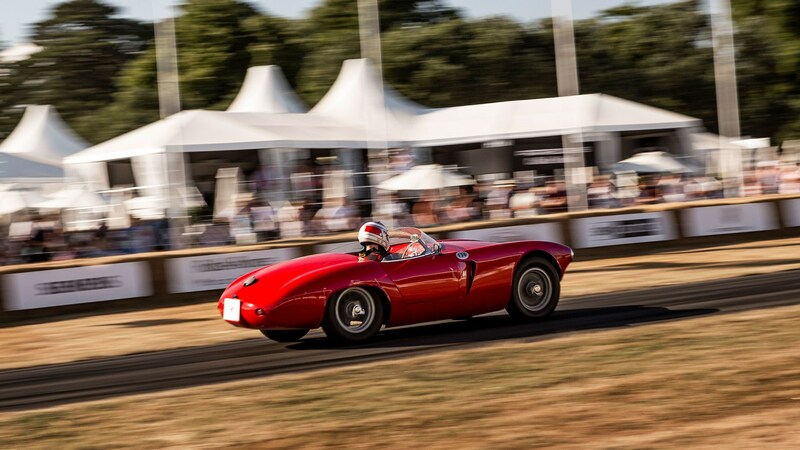 Conceived at the beginning of the 1950s as a limited-run series, the Sport Spider and 2000 Sportiva Coupe shared many components with the regular 1900 production car, yet thanks to coachbuilt bodywork and weapons-grade fettling on the engine and chassis the end result was markedly different. Under the smooth, sculptured curves of the bonnet, the bore was taken out to 85mm (increasing capacity to 1997.4cc – just under the 2.0-litre touring car limit of the day) and the compression ratio notched up to 9:1. Meanwhile, the rear wheels benefitted from a De Dion triangular axle setup, as well as the helicoid-finned drum brakes that I was about to put considerable faith in. 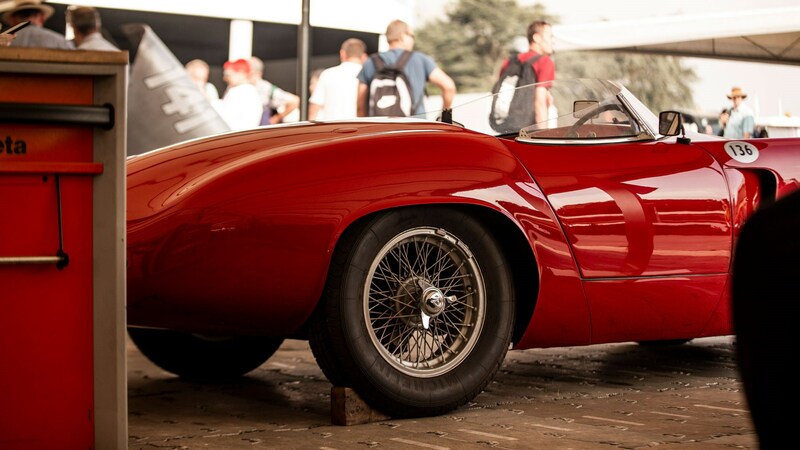 Perhaps the biggest modification, though, was the strict diet imposed by lead engineer Giuseppe Busso. Kerb weight was cut from 1100kg down to just 900kg, giving a power to weight ratio of roughly 150bhp per tonne from an outright output of 138bhp at 6500rpm. Plenty of poke for the time and more than enough to get me in trouble. Wind back 30 minutes and I'm meandering my way down the hill towards the start line. The car itself is behaving fine – ominously so in the eye of my paranoid mind – pulling cleanly as a I give the throttle a squirt in second. Coming to a halt behind a Ferrari 250 GT SWB-C SEFA, I clock the ‘Beast of Turin’ Fiat S76 Record rumbling past on my left, followed quickly by a 1960 Jaguar E2A and Nick Mason’s Ferrari 250 GTO. I’m in good company. Roberto, the technician from Alfa Romeo’s Museum near Milan where the 1900 SS is based, poses nonchalantly next to the car, hands on hips as he observes the multi-million-pound traffic jam assembled before him. Wearing his battered jeans and blue and gold Alfa polo, he is the embodiment of nonchalant Italian cool. I on the other hand am a sweaty mess, desperately trying to pull my phone out of my pocket for a quick photo and not look out of place amongst automotive royalty. Pictures taken, I make my final checks and go to restart the engine. It fires first time, gently thrumming away as the twin-choke carburettors breathe in the warm summer air. The straight four’s pulsing tickover is even and measured, it’s rhythm occasionally breaking as the car politely asks for a quick blip of the throttle. My mellow image of serenity is abruptly shattered. The Beast of Turin has filled my mirrors, its driver manfully trying to coax the thunderous 28.5-litre four-cylinder engine into life. It’s spluttering, banging and roaring like an angry lion with manflu, refusing to respond to its keeper’s increasingly desperate efforts. All the while the Sport Spider is purring; totally unfussed, patiently awaiting its moment. Nothing like a bit of perspective to settle the nerves. I take my place on the start line, nod to the marshal and build up a suitably aggressive number of revs. I’m only here to do a demo run but the tragedy of not giving the car everything I dare prays on my mind. They probably only bring it out a few times a year, best do it justice. I’m off. The car bogs down. Damn – I probably could have gotten away with a few more revs, still unsure – and slightly apprehensive – of the nature of the beast. I’ll learn a lot more through the first corner. Stay left, keep it in a straight line, squeeze those drum brakes firmly and look through the bend waiting to get back on the power. Time for a leap of faith. As I go for the throttle on corner exit it’s like a storm cloud lifting, any lingering doubt over the car evaporating. Bodyroll is considerable, but there’s no feel of unpredictably. No suggestion that if I’m too brave on the brakes, or too trigger-happy with the throttle I’ll be facing the wrong way in an instant. This isn’t like any classic I’ve ever driven. 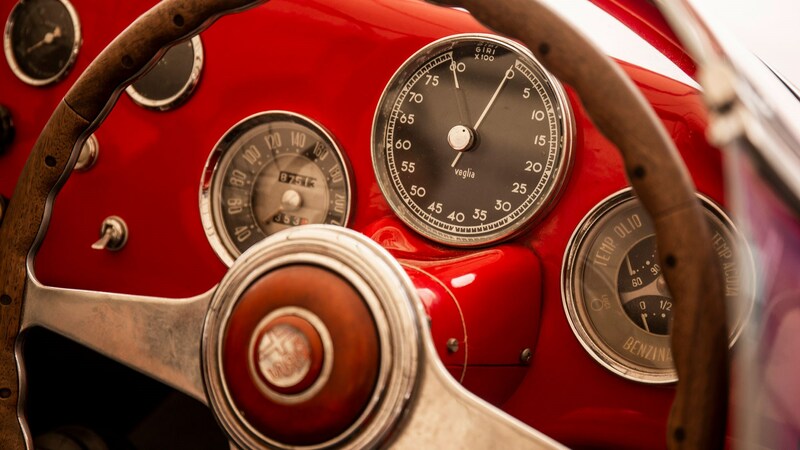 Buoyed by the car’s competence, I press on hard, unwinding the large wooden wheel for the long Park Straight, ringing the engine out as far as I dare. It is a truly wonderful thing to drive. 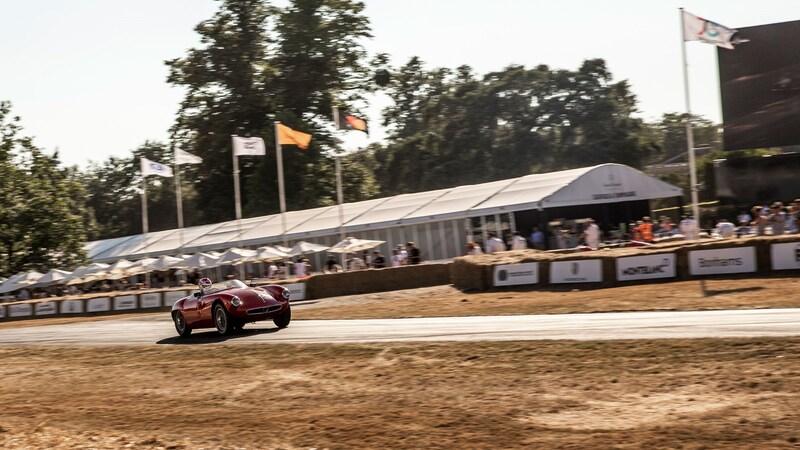 And yet, odd as it sounds, I envied the assembled spectators watching and listening intently to the pure elegance of this blood red bullet gliding past. From the smooth, subtle haunches at the rear to the powerful lines of the protruding headlights, it is a mesmerisingly pretty design. It’s proportionally perfect, yet radiates staggering beauty in the way that only imperfection can. Bertone – and designer Franco Scaglione – outdid themselves here. Not wishing to remodel said design, I bring my mind back to the task at hand. Flying under the footbridge towards the end of the Molecomb I spot the crest of fate. Hard on the brakes – better than in any pre-1960s car I’ve ever driven ­– blip the throttle – God this thing sounds good – and slot the gearbox into third. I surprise myself with my own dexterity and coordination, but in truth it’s all down to the car. It’s as forgiving and docile as you’d want – but not dare to hope – when you dream of driving one on a sun-drenched Sunday in the countryside. The body rolls, but the tyres hold on well through the left hander, car and driver thankful for the bone-dry tarmac beneath them. Exiting Molecomb I’m back on the power, realising that I could either have a) carried more speed or b) gone for second gear. But no matter, I snap myself out of the clutches of hindsight and steel myself for the The Wall – a daunting right-left with an unforgiving stone wall to avoid on entry. No heroics, here, just get it done. A short climb uphill and the finish line is within site. I’d expected to feel relief at bringing this unique piece of automotive history across the line in one piece. Instead, I found myself once again thinking what I could have done differently, how I could have improved, how I could have done the Sport Spider greater justice. Maybe I was just desperate to have another go, or simply prolong the experience that little bit longer. Either way, I had done my bit. And so had the car. You never know quite what you’re going to get when you drive a classic for the first time. Torrid handling, poor reliability and general disappointment are frequent occurrences, and reason enough not to meet your heroes. The 1900 Sport Spider, however, was damn near perfection.